Prorating these percentages to his 442 plate appearances in 2007, Sosa has batted in 23 more RISP situations than his career average and 17 more than his career best. 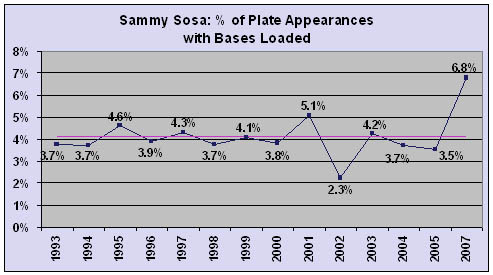 One possible explanation is that Sosa spent 1993-2004 in the NL, where pitchers hit and scoring is depressed. For several reasons, this explanation doesn’t work. On a league-wide level, the difference between RISP situations in the American versus the National League is only about 0.3%. Also, in his forgettable season in Baltimore, his proportion of RISP situations fell comfortably within the bounds set by his many years in Chicago. How about Boston’s Ortiz and Ramirez? What about Texas’s best hitters (here or departed)? Sosa bests them all. 111 AL hitters have at least 100 appearances with a runner in scoring position. Sosa ranks third – behind Garret Anderson and Emil Brown(?!) – in the proportion of RISP situations to total appearances. Relative to the American League as a whole, the best hitters on the best teams, and even his glorious past, he’s been darned lucky. 2) Sosa has been extraordinarily adept this season at hitting with runners in scoring position. However, Sosa has displayed NO special ability to hit in the clutch during his career. 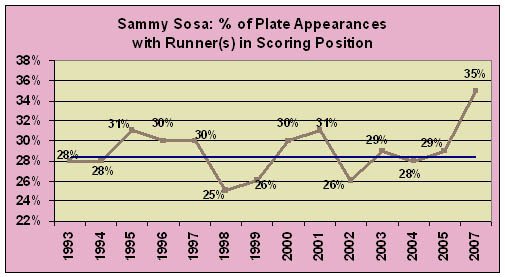 From 1993 through this season (excluding 2006), Sosa has averaged .278 overall and .283 with runners in scoring position. 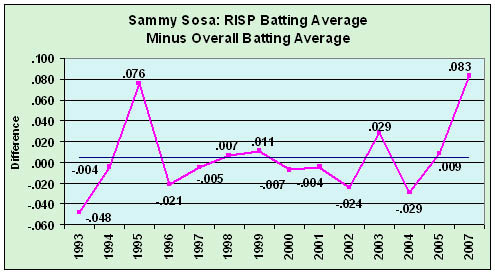 During those 14 seasons, Sosa’s RISP average has strayed from his overall average by more than 30 points on only three occasions: 1993, 1995, and 2007. This season, Sosa is batting .336/.390/.597 with runners in scoring position; his RISP average has exceeded his overall average by a remarkable 83 points. Similarly, Sosa has a career .553 RISP slugging percentage and a .552 overall percentage. This season, his RISP slugging is 133 points above his overall slugging. As a result of this prowess, Sosa has plated 66 baserunners (excluding himself on homers) in 154 RISP situations, equal to 0.43 runners per plate appearance. His average during 1993-2007 is 0.32. For the sake of argument, assume Sosa plays in 2008 and receives the same number of appearances, a typical proportion of RISP situations, and drives in runs at a typical rate. How many baserunners would he plate? Suddenly, Sosa loses 25 RBI in RISP situations. If Sosa had only 65 RBI this season instead of 90, would Washington and others still clamor for his return? Note also that this calculation assumes no further age-related decline, a dubious assumption to make of a soon-to-be 39-year-old. Just to clarify, I’m not discounting his achievements this year. Runs batted in are partly a function of opportunity, and Sosa has taken advantage. For a guy with a .309 OBP, he’s been pretty useful. He can still hit lefties, and I was surprised that Texas found no takers for him during the trading window. He’s also acted professionally throughout the season and didn’t complain when relegated to the bench. So thank him and send him on his way, because next year, if given another 450 appearances, he’s far more likely to be an out machine than an RBI machine.